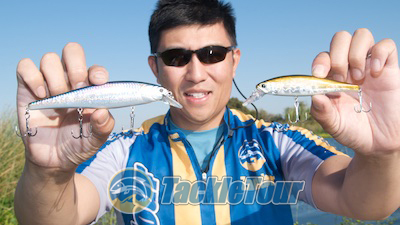 Introduction: As popular and effective a jerk/rip bait as the Vision OneTen is, one bait suspends shoulder to shoulder with that bait on the rod tips of the TackleTour Editorial Staff. 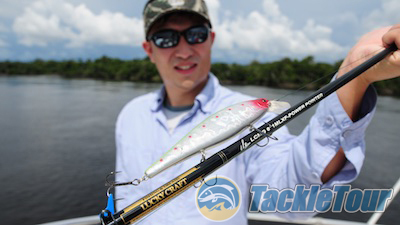 That bait is Lucky Craft's Pointer Minnow. This is the first jerkbait I had ever seen Zander tie on, toss out, and rip back. In fact, he had never handled a Vision OneTen until I gave him one back in 2005 and up until that point, he was all about the Lucky Craft's Pointer Minnow. 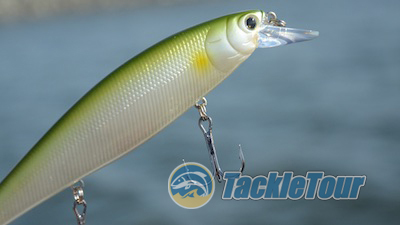 A bait that requires no introduction, Lucky Craft's Pointer Minnow. All this time, I just assumed there was a review on this article already on the site and while there is an Autopsy article on the 100, and a review of the 65sp, there's no real on the water discussion of the larger sizes for bass. Until now - presenting our look at Lucky Craft's Pointer Minnow. The Pointer 128 (left) and Pointer 100 (right) are a staple in each TT Editor's tackle box. Impressions: The two most popular sizes of Lucky Craft's Pointer Minnow for black bass are the 100 and 128, but the bait is available with the same action and same diving depth in two other smaller sizes too - 65 and 78. These numbers equate to millimeters with their approximate sizes in inches listed in the table above and each bait is available in a host of different colors. Zander's favorite is the 100 which weighs in at five eighths of an ounce (5/8oz) while mine is the larger 128, a one ounce (1oz) bait. We've been fishing this bait for over a decade. 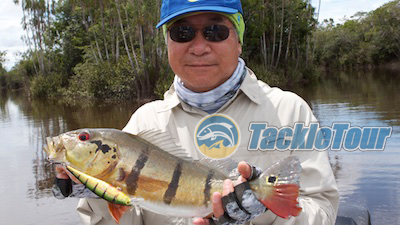 Real World Tests: The Pointer Minnow has seen action with us out on the California Delta, up at Clear Lake, and even down in the Amazon Basin in pursuit of Peacock Bass. We've thrown it on all different line types, but my preference is a good quality fluorocarbon with a little stretchiness to it like Seaguar's Tatsu FC or Sunline's Sniper FC. 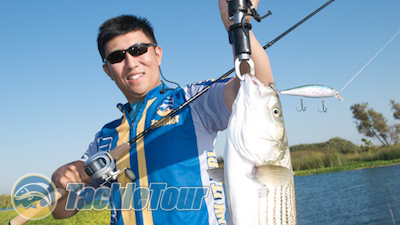 It's a very effective rip bait for striped bass. Castability: As Zander uncovered during his Autopsy report on this bait, the Pointer is weighted with moving brass weights that slide front to back during cast allowing you to really wing this bait under just about any wind conditions. Whether that wind is coming from the side or is right in your face, the Pointer Minnow can cut through that distraction and land on or beyond your target pretty easily. The 128, with its bigger mass, is especially effective in windy conditions. Remember this guy? Yes, the Pointer 100 is a favorite of JIP's! 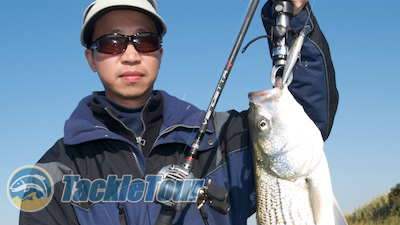 Dive Time: Click your reel over once the bait touches the water, wait for those ripples to dissipate, begin your retrieve and the Pointer Minnow dives down quite readily to is working depth. This bait is rated at four - five feet but there are times I feel it gets down to at least six feet. 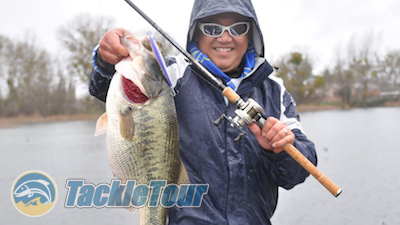 When you're working the bait at whatever depth, there's really good feedback in your line in the form of resistance as you twitch your rod tip. Some CA Delta fun with the Pointer 100. Suspending Action: Stop your retrieve and the Pointer Minnow suspends in perfectly neutral position parallel to the water's surface. Give it a couple of twitches with your rod and it continues moving in a sort of underwater, back and forth, walk the dog type action. Stop and again, the bait just hangs there in a very eerie way. This bait is super easy to cast even in a driving rain storm. Additional Observations: Along with the moving weights for casting, there are internal glass and plastic beads that together with the brass weights serve as noise makers giving the Pointer a unique rattling and knocking sound underwater. 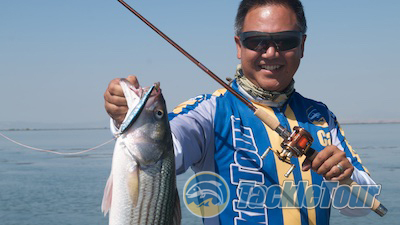 This makes it a great bait even when visibility is low because the fish can key in on the bait's sound. We took the 128 size with us to the Amazon back in 2010. Design/Ergonomics: Lucky Craft's color palette for their Pointer Minnow is fifty one colors strong. However, not all of these colors are available in every single size. The 100 probably has the best selection and the 128 the least and of course, if you're familiar with Lucky Craft's colors, then you're aware that some, like American Shad, come with a $1.00 added premium. It bears emphasizing that all four available sizes in this bait behave the same way underwater. The only real difference is their relative sizes. My brother with a schoolie Peacock courtesy of the Pointer 128. Price & Application: Retail pricing on the Pointer Minnow ranges from $14.99 to $17.99 depending on the size and color you select for each size. 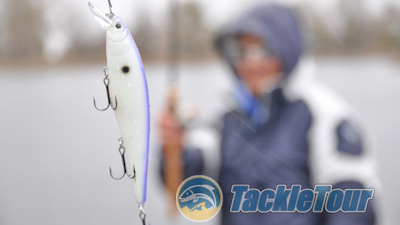 Otherwise, throw this bait anytime you suspect fish are suspending in the water column or coming up to chase bait. Retail pricing on the Pointer Minnow ranges from $14.99 to $17.99 depending on the size and color you select. A chunky Clear Lake, CA bass. 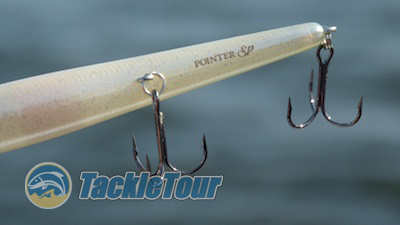 Is it any wonder why the Pointer Minnow wins our Editor's Choice Award? Conclusion: Lucky Craft's Pointer Minnow is considered by many the gold standard by which all other jerk and rip baits are measured. I'd argue it's one of two or three standards by which the industry measures itself one of the others of course being the Vision OneTen by Megabass. 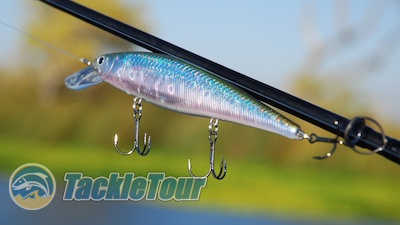 Where Lucky Craft has the other baits beat though is in the fact the Pointer Minnow is available in four different sizes, all four of which behave the exact same way in the water. To deliver on that level of consistency is a testament to Lucky Craft and their engineering team. The only thing left here is to hand out editorial recognition and we all know what that means. Lucky Craft's Pointer Minnow wins this Editor's Choice Award. Looking for Lucky Craft Pointer Minnows?